If the star KIC 8462852 is on your mind — and the lively and continuing comments threads on the topic in these pages suggest that it is — you’ll want to know about a new campaign to support further study. ‘Tabby’s Star,’ as it is informally known (after Tabetha Boyajian, whose work at the Planet Hunters project brought the star into prominence), continues to vex astronomers with its unusual light curves. What is causing the star to dim so dramatically remains problematic, with suggestions ranging from comet swarms to extraterrestrial engineering. A Kickstarter project is now in the works to support further investigation, hoping to extend an effort that has already begun. Boyajian’s team has initiated observations on the Las Cumbres Observatory Global Telescope Network, a privately run effort that maintains telescopes around the world to make sure an object can be examined continuously. Four years of Kepler data have shown us that the dips in the light curves from KIC 8462852 are not periodic, which means the monitoring needs to be continuous because we can’t predict when the next dip will come. So far, the Las Cumbres network has given 200 hours of observing time, work that will support observations through the summer. The Kickstarter campaign intends to raise $100,000 to fund an entire year of observations, which will include a total of two hours per night. The plan is to observe the star at different wavelengths, alerting larger facilities when something interesting is happening. Variations in dimming at particular wavelengths can tell us much about what kind of material is causing the effect, perhaps supporting a hypothesis like cometary gases or dust. When the star dims again, we will use telescopes around the world to measure how much the star dims at different wavelengths. Since different substances have characteristic absorption patterns, this will tell us the composition of the intervening material. For instance, if it dims much more at ultraviolet wavelengths than in the infrared, we will know dust is to blame. If we see the characteristic pattern of cometary gases, that will help confirm the cometary hypothesis. And if we see the same brightness changes at all wavelengths? That would indicate that whatever is blocking the starlight is big and opaque—inconsistent with comets, but consistent with the alien megastructure hypothesis. The intense interest in KIC 8462852 created a flurry of work among amateur astronomers, including dozens working with the American Association of Variable Star Observers. We do have data from the AAVSO effort so far, but as Boyajian notes in the Kickstarter materials, there is a good deal of scatter in the measurements depending on observer and equipment. 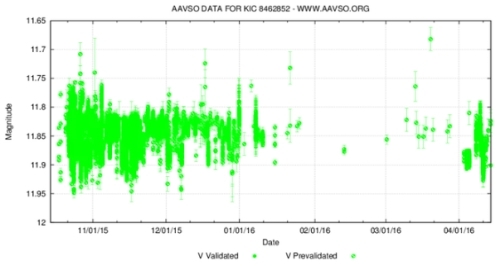 Image: A graph showing brightness measurements (in magnitude) for KIC 8462852 contributed by over 50 AAVSO observers. Although the star displays constant brightness during this time, observer-to-observer offsets smear out any signal of a dip. Credit: AAVSO. 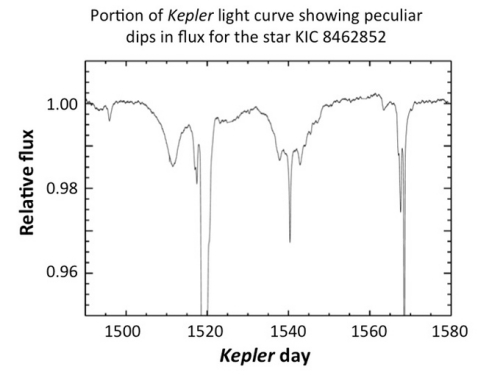 Thus we get not only continuous monitoring of KIC 8462852 but a much more finely calibrated way to look for future dips in the light curve of the star. You can see, too, that this is the kind of project to which a fast and relatively inexpensive campaign like this one is ideally suited. Getting observation time on large facilities is always tricky because of the high demand, and private observatories are usually paid through grants, most of which don’t make it through the funding process. When you need a lot of telescope time to look at an anomaly like KIC 8462852, crowdsourcing turns out to be the best and perhaps the only viable option. A search through the archives here will pull up the numerous articles about KIC 8462852, but I’d also urge you to dig into the comments section, particularly for the more recent posts, as the discussion has been lively. For overall background, you’ll want to have a look at this thorough explanation of what we’ve learned about the star so far from Paul Carr, who is also active in the comments threads here. Paul’s Dream of the Open Channel is a site you’ll want to follow on a regular basis as we continue to look at this puzzling star. He is also an active podcaster on SETI and related matters, with links provided on the Open Channel site. As for the Kickstarter project, I see that as of Monday morning, it has raised close to $20,000, with 25 days to go toward the $100,000 goal. The Las Cumbres observing campaign offers us precious new data to add to the Kepler cache and the continuing AAVSO effort. As to Kepler itself, we’re now deep into the K2 mission and KIC 8462852 is no longer observable. To find out when the next dips will occur and test theories about what may be happening here — ringed planets? dust clouds? cometary debris? — Las Cumbres looks like our best bet. Let me encourage you to contribute what you can as we get this observational campaign into gear. I enthusiastically support this kickstarter, but I think it’s apparent that a 20% dip would be clearly signalled in AAVSO data. Is it possible to have each observer take a reading from a neaby reference standard star (the same for all observations) as a base line as well as from the target star in the same time frame, it would be a way of reducing observer errors? That is what they routinely do. If you download the data you will see comparison stars and check stars in the listing. Just one star not several as can be seen, if it is just one star all the readings will have one reference. Do you have access to a detailed spectrum of Tabbys star so I can have a look at it please? Unless the dip occurred for ONLY A VERY SHORT TIME PERIOD(case in point, May 4). I believe that SIMULTANEOUS observations by Kickstarter AND AAVSO participants are going to be CRUCIAL! AND: By the way, I guess the NEW software package is up and running at Green Bank! Wright et al just got 25 hours of scope time. Of course, if Philip Lubin is right, it will be an exercise in futility, and we will have to wait until De-Star comes on-line to get any definitive answers! Thanks for the link to Paul Carr’s blog…fascinating stuff! One of the big problems in getting grant funding for ongoing monitoring is that this project would be seen as very high risk – there is no clear indication of when the next dimming is expected. All grants are risk assessed and the chances of getting huge chunks of telescope time for this target are minute unless this Kickstarter project is successful. The strange dimming for this star was identified by amateur astronomers (Planet Hunters), ongoing monitoring is now likely to be funded by amateur astronomers (and the general public), and a solution could also be found by amateur astronomers. TESS may give us millions of transit events and amateur astronomers could be the key to identifying further unusual targets as we search for the elusive signs that we are not alone. Apropos of nothing (as usual), but it’s interesting that while Tabby’s Star is called “The Most Interesting Star in the Universe”, it’s primarily interesting because of observations made by Kepler. Now, Kepler only performs such observations on a TINY slice of sky. So, who knows what other wonders are floating out there in the black? We’re prepared. Trying to understand the Most Interesting Star in the Universe involves half of that reaction already. If you look at the first figure posted here on this article, presents a good zoom in. The event on Kepler day 1540 to me is clearly the transit signature of a very large planet with a system of rings. Harry: Can you elaborate more on the “Q8” light curve? What it is and what sets it apart? yip, to me it is a planet with ring/moons. But it does not need to be a big planet as a smaller one with a weaker gravity field will bloat more for the same amount of light. There are emission lines at around that wavelength which could indicate CO2 and/or CO as they have emissions lines around that wavelength. All of these are ruled out by the data, except for the last one. No one knows where such a large swarm of very big comets would come from, although it is at least conceivably consistent with what is known. Comets are can obscure light in a way that would not produce as large an infrared excess – they just boil their material off into space for the most part. Coacervate: Tabby had to hold her nose when she said it, but a comet swarm would at least absorb the energy and convert it to latent heat in outgassing volatiles. Where/how a star collects that many comets is as big a mystery as the light curve anomalies. Not wishing to provoke an argument but if you cant find something that is not on the list of rejects then you are not fueling our “candle in the darkness”. Eric: “Q8” stands for 8’th quarter. It is NOT MY name for it. I tookthat designation from one of Jason Wright’s tweets(thus the quotation marks). It is the OTHER SOLITARY LARGE(15%) dip. It is the one which light curve EXPERTS Eva Bodman and Anne Quillan said CANNOT BE from a FAMILY of comets because of its exceptionally smooth uniformity! Let’s ante up. We have to get new information, or we’re gonna drive ourselves nuts. You are right, I am at the bottom of the coffee jar on this one…we are going to need more information. The 21st Century appears to stand ready to serve up the juiciest of astronomical dishes for our delectation. I would say “…alien hypotheses should always be the last resort…” for this reason: Much like a “God of the Gaps” argument in evolution and the origin of life and etc. where when you run into a brick wall you have a choice to make—-“God must have done this” or you can press forward and try and find a logic based (more rational?) explanation, which has served us well in the past. This stuff going around at Tabby’s Star, the alien scenario, as much as I would love to see it vindicated? ….the alien thing is a catch-all, much like the God of the Gaps. You can just rationalize a couple dozen scenarios that ETC is causing the dimming events. Instead, we should concentrate on (1) Proposing “natural” explanations and then trying to shoot them down, for example, spectral evidence when it dims again, do we see massive comet swarm evidence? …and we get a better IR signature, etc. (2) When all possible natural scenarios are ruled out….. we are left with the inexplicable. Along those lines: The James Clerke Maxwell Telescope recently observed KIC8462852 in the MICROWAVE spectrum(alas, ALMA CANNOT observe KIC8462852)and CONSTRAINED the amount of dust in THE ENTIRE SYSTEM to NOT MORE THAN 8 Earth masses, making a Late Heavy Bombardment Scenario(even one in its very early stages, as Lisse et al proposed) less and less likely. Well, as comets are decidedly dusty and with the shear number and size the ‘comet hypothesis’ demands, what does this finding have to say about said comet-hypothesis? (Is the dust measurement close-in to the star and the comets domain far out? so there need not be any correlation?. Hmmmm. I am curious why aliens are considered unnatural. Although I did notice you put quotes around “natural” indicating, I believe, that you too see that they are nothing less than completely natural. So far, all of the life we have discovered in the universe has been natural or from nature with the possible exception of a very high-maintenance bacterium constructed in a lab recently. If we could agree that life wherever we find it is largely of nature then should a hypothesis that invokes aliens be relegated to “last resort”? No it should not. After all, it does not resort to conjurings or spirit dancing. I take your point regarding the “Aliens of the gaps” explanations. But when you consider that one, God, is an imaginary being with no basis in logic for its existence, you know, like Santa Claus and the other is a hypothesised example of an element of a set we already know exists then the analogy falls over. Currently the known set of life consists of the life on Earth, which I admit is quite limited but I am certain that you agree that it is strong evidence that life exists in this Universe. So I am not persuaded and challenge the assertion all the more vigorously. To say that it is always the last-resort hypothesis is not a scientific way of thinking. That said, most of the scientists I have worked with were strangely unlogical about most of their researches. If you can imagine a secret observer trying to understand our science methods, wouldn’t that observer be astounded to learn that we, as living intelligent beings declared that life was always the least likely explanation of any extra-worldly phenomena? No doubt by now you can tell that I find this anti-life bias disturbing and harmful to the scientific process. And if you really want to know what’s bugging me…why won’t NASA try or try to help ESA or anyone interested in looking for life on Mars? At least a Beagle 3 attempt is warranted by the evidence accruing since the Vikings. There is a post on the setiathome forum which claims that extreme brightening (by 6 magnitudes!) has been found by the AAVSO group. I’m unable to find anything related to this supposed brightening on the AAVSO site. Can anyone confirm or deny this rumour? According to a LATER posting on the SETI@HOME website, the six magnitude data has been MANUALLY REMOVED, and, in its place, REPLACED by ANOTHER SIGNIFIGANT DIMMING EVENT! This was probably just an error in data entry! Definitely worth supporting. Is this the first Kickstarter for basic science? She’s a third of the way there, with 16 days left. Side pledge: if I see anyone this year with one of Dr. Boyajian’s WTF t-shirts, they’ve got a beer coming. Is it possible that there are multiple mega planets, sharing an odd orbit, with moons in a deep orbit around this sun? Congratulations, everyone. We’ve upgraded to a much better type of suspense. Nice work to all involved! A nailbiter indeed. Now that Kickstarter is(or soon WILL BE)fully operational, a HUGE QUESTION has just arised: Can observations of OTHER INTERESTING OBJECTS be made while KIC8462852 is NOT being observed? The reason I ask this NOW is the abstract(NO, I have NOT read the PDF. It appears to be a wee bit to TECHNICAL for ME)currently up on the exoplanet.eu website. “Our Sky now and then- searches for lost stars and impossible effects as probes of advanced extra-terrestrial civilizations.” by Beatriz Villoreal, Inigo Imaz, and Josefine Bergsteadt. An EXERPT from the abstract is as follows: “…we search for objects not found at the expected positions in the Sloan Digital Sky SDurvey(SDSS)by visually examining images of ~290,000 USNO-B1.0 objects with no counterpart in the SDSS. We identify some spurious targets in the USNO-B1.0. We find one candidate of interest for follow-up photometry, although it is very uncertain. If the candidate is eventually found it defines the probability of being a disappearing object event…”. Am I correct by inferring that a star may have COMPLETELY DISSAPEARED a la “Pandora’s Star”. If KIC8462852 keeps fading without pause, it will ALSO completely disappear as well, AND THIS IS THE TIE-IN! Should Boyajian and Wright contact Villoreal et al for the co-ordinates? Could some sort of JOINT EFFORT periodically check the part of the sky where the object was BEFORE it disappeared to see if ANY KIND OF RADIATION REMAINS? I finally slogged through the entire PDF(ouch!). The candidate’s USNO-B1.0 name is 1084-0241525. RA 224.4024 DEC 18.41725. I hope this is observable with the Kickstarter telescope, but, even if it IS, it was SO FAINT TO BEGIN WITH no radiation may be detectable with the Kickstarter telescope EVEN IF IT EXISTS!